This carpet fragment dates to the early period of Ottoman rule in Turkey. Its design consists of rows of hooked motifs and stylized leaves in dark blue, green, and yellow on a red ground. 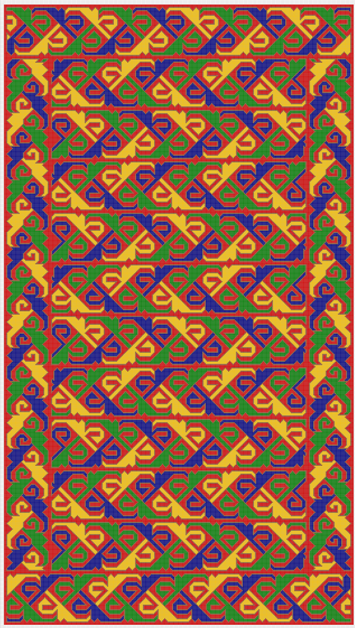 The interlocking hooked motifs (probably stylized vines), in particular, connect it to later carpets from western Anatolia. My questions to you are, what later carpets from western Anatolia does it relate to? And does anyone know more about this fragment? Puzzling fragment. I haven’t seen any extant rug with this kind of pattern or even anything close. With a lot of positive thinking, one could perhaps see a very vague analogy with the borders of the two (younger) rugs below. Anatolia, sixteenth or seventeenth century, F. Spuhler, Die Orientteppiche im Museum für islamische Kunst, Berlin. Or with the field of some (older) Seldjuk rugs, albeit with a fully different palette. Pierre, what about the border of this Shirvan? The border is generally called “eagle’s head” or “eagle’s beak” and it’s a classical Caucasian border. I agree with you it is hard to place this fragment to anything extant. The second example in your post shows a rug that probably has a border like the centre. Rugs with a main border through-out are quite common, but the ones I have seen have the border in the field horizontally. Spot on. The border of the Shirvan would probably have derived from something like the border of the fragment, very interesting. I do not know if it is a European thing expecting curators to be accessible, but I am unable to reach any curator through email at the MET to ask if the fragment is C14 dated or dated from archaeology or if it is dated because the elements in the fragment are enclosed with brown so common in early rugs from Anatolia. Is this design specific for the Shirvan area? The “eagle’s beak” border is not exactly the same motif of the MET fragment (notice the “beaks” are bent outward). 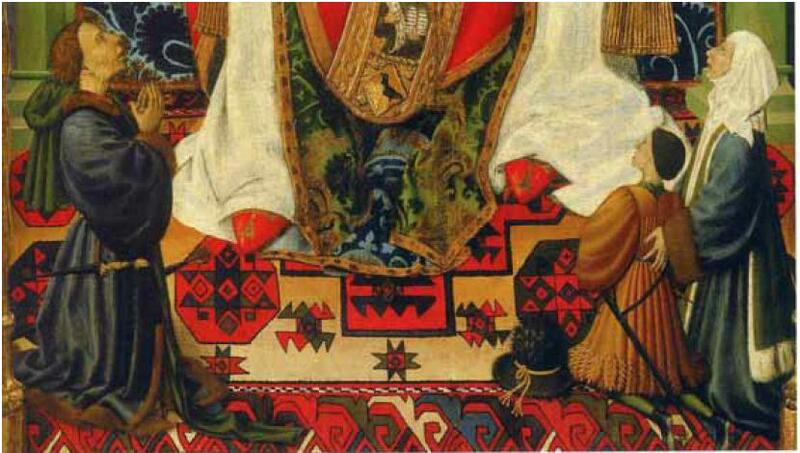 In “Tribal & Village Rugs” Stone put it in the Shirvan section but I think I saw it on rugs of other areas of Caucasus. Perhaps it’s more prevalent in Shirvan. Similar versions are also used in Persia. See the following scan from Stone’s book. About the "beaks" direction: I am looking at the plate of a Kuba rug with beaks bent inward, like in the fragment. But I have put away the scanner so you have to trust my word for it. Silly of me! Also "Motif C-99" has the inward beaks! Obviously a design, not a photo. For that, ask Mr. Stone. 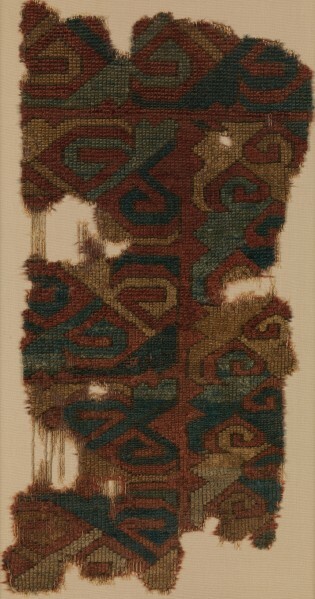 The fragment below, given as Anatolian, XV century, could be seen as a parent of the MET fragment and Stones' rug: a field fully covered with a unique small motif, which could be inspired by a beast (dragon ?) too. Hmm…, please elaborate because you lost me. To me the design in the fragment seems to derive more from a floral origin, if not I would put my bet on birds. It is also difficult to determine the date of the MET fragment and the Anatolian fragment, both in time and design. Thank you for the Stone reference. I have the same book but completely missed the design. Interesting that the design is horizontal in the field and not vertical, the vertical is more common. Can the Veramin attribution of your sample be challenged? Looking through my literature (which is scant) the design of the fragment, through your guidance, seems firmly based in Caucasia. If this could be affirmed by research (guesstimation), and the MET fragment is C14 dated, it would be the oldest affirmed weaving from Caucasia and could also question many Anatolian affirmed attributions. Am I am aiming too high? Can the Veramin attribution of your sample be challenged? I have no idea. That’s why I copied in my last post Stone’s references to the rug: I was hoping that someone with access to them would come and enlighten us. About the possible Caucasian origin of the fragment, that’s the classical one million dollars question, isn’t it? Thank you again for bringing the MET fragment up! Last edited by Filiberto Boncompagni2; February 20th, 2013 at 11:10 AM. Noticed that fig. 61 of the Salon has the same border. B. Martorell, 1437-1442, St. Peter’s altar, Girona. Spain. The image has a very low resolution, but I think you are right! Indeed, it could be identical. I'll try to find a better view of Martorell's painting. Anatolia ?, Caucasus ? (At the date of the painting the Black Sea was still easily accessible to Venetian / Genoan ships and Caucasian rugs could easily have been imported from there, via Trebzond or Tana) or Spain / Aragon (given the nationality of the painter and the claim by experts that Mudejar weavers frequently opted for yellow field backgrounds). The strange thing is that MET’s web page says The interlocking hooked motifs (probably stylized vines), in particular, connect it to later carpets from western Anatolia. I checked my copy of Uwe Jordan’s book “Turchi” and your database that has more than 500 examples of Turkish carpets: I didn’find a single example of this motif. And Stone mentions only Caucasus and Persia in relation to it. out of around 390 image. Here the motif is in the field.